Snow Plough : SARL Maxima, Specialists in the sale and reparation of machines and accessories for the construction industry. Importer and distributor of both hydraulic and pneumatic equipment. Don't be caught out this winter! 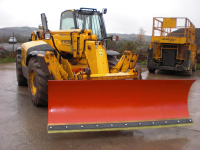 Our Snow Ploughs are idealy manufactured for telehandlers, large tractors, compact tractors, skid steer loaders and fork lifts. They are fitted with a reversible, double edged Urethane blade which can be positioned in 3 ways: 15° left, 15°right and centre. The high quality construction means that you will have this quality attachment for years to come and will never get caught out in the snow again!